Killowen Contracts has extensive experience across a variety of sectors and, with a commitment to providing only the highest standards of workmanship across all projects, the work done by the firm on the Burren Community Centre was of the highest quality. Following a competitive tender process, the £1million project was given the go ahead by the local community organisation, Burren Vision, and was further supported by the Big Lottery Fund Space and Place Programme along with the Community Fund for Northern Ireland. “Following the hard work of the community representatives in securing funding, we were very proud to have been involved in such a landmark building within the local area. 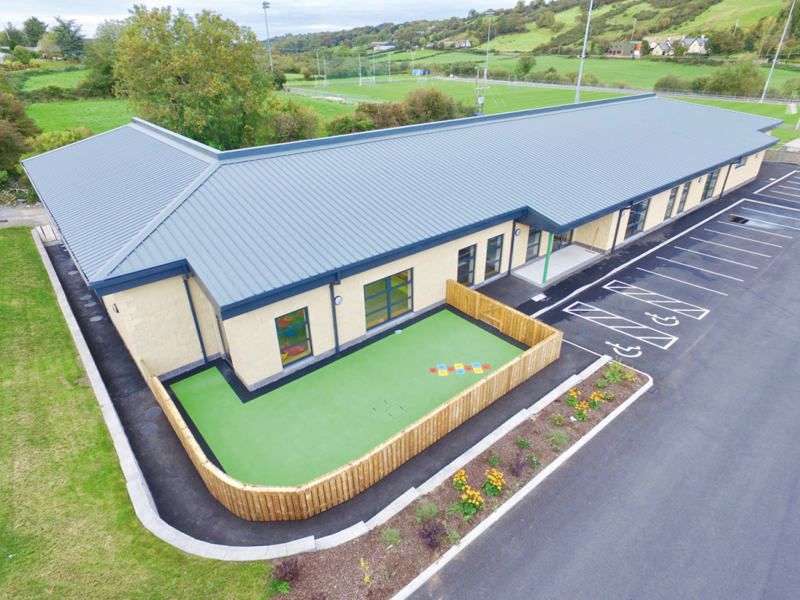 Community involvement was extended during Phase 1 of the project which, in turn, provided the base of a social hub offering enhanced health and wellbeing, excellent facilities and services for all user groups,” said Brian McGivern, Contracts Director at Killowen. The existing community building had been in disrepair following construction in 1978 and was dilapidated and no longer fit for purpose. Following demolition, which included specialist asbestos removal, Killowen completed the substructure works and erected a steel frame incorporating a facing block finish externally with cladding to the roof. Building construction was partially adopted to ensure ease of continuity when funding for Phase 2 is secured, which will enable construction of a sports hall and gym facilities. “The building is a vital part of the area and community integration, therefore it was important we continued to engage with local operatives, suppliers and sub- contractors. Such collaboration ensured local economic sustainability and community involvement. We continued to implement our high standards of environmental management – reducing, reusing and recycling as much material as possible while we also engaged with the local primary school to involve local children, who in turn will use the building for years to come,” said Brian. Pupils were treated to a number of site visits and a presentation where they were educated on construction methods, health & safety principles and the merits of sustainability. The centre now stands as a central hub within the community, utilised by all user groups and providing programmes for young and old. These programmes focus on life skills development, mental and physical health, specialist support, education, art, craft and culture. Over the different phases of the project, the new facility will provide much greater space, including multi-room provision which will enhance the range of courses/activities and services that can be provided to the community on an ongoing and concurrent basis. This enhanced space will provide a better structure and will also allow for greater partnership working between groups and agencies in the area. It represents a high-quality build which the village can be proud of and will be at the forefront of community development and collaboration for the future. “We’re proud to have been involved in such an important project for our local community. The fact that it will provide much- needed services and act as a social hub for the neighbouring area makes it an extra special project for the team here at Killowen,” said Brian. The first phase of the Burren Community Centre is just one project recently completed by the firm. 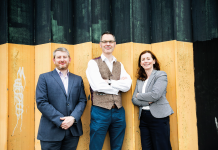 Very much a family- owned business, the underlying ethos behind Killowen Contracts is on teamwork and providing a hands-on personal approach to clients. The firm’s directors are personally and proactively involved at every stage of the company’s projects, assigned to manage and oversee its carefully selected contract team and encourage stakeholder engagement and collaboration from appointment to completion – ensuring success and client satisfaction beyond expectation. Colinwell supplied its Allan Block Mortarless Retaining Wall system, along with its Split Face Architectural Masonry Blocks, to the Burren Community Centre project. Given the change in elevation on site, the Allan Block system provided an ideal solution on how best to construct the necessary retaining walls. “The use of our Allan Block Mortarless Retaining Wall System allowed for the quick and simple construction of a retaining wall that would be attractive, durable, maintenance free and provide a cost saving when compared to tradition retaining walls” said Michael McGuigan, Business Development Director at Colinwell. Additionally, the Split Face Architectural Masonry Blocks (in Whinstone and Sandstone colour), which were used on the main building, allowed for the construction of a visually appealing finish that will last for generations. Colinwell has worked with Killowen Contracts on several projects in the past. “We’re actually currently working with them on an extension at the SSE Arena and look forward to working with them again on future projects,” added Michael McGuigan. The experienced team at McKernan Electrical provided their services to the Burren Community Centre project, helping to deliver a building of the highest quality. Electrical requirements on the project were delivered by the company which is headed up by Dan McKernan and his son Brendan, who joined the company in the 1980s. McKernan Electrical has been operating in the local area since 1962. Dan and Brendan both live and work “The company has built up a reputation for its expert workmanship and for delivering projects to schedule.” in the local community and for that reason, were delighted to have been involved in this important project. Although a very tight deadline posed challenges for the McKernan team, they rose to the challenge and completed their scope of works in a timely manner. McKernan Electrical has worked on a range of projects across Northern Ireland and has built up a reputation for its expert workmanship and for delivering projects to schedule. 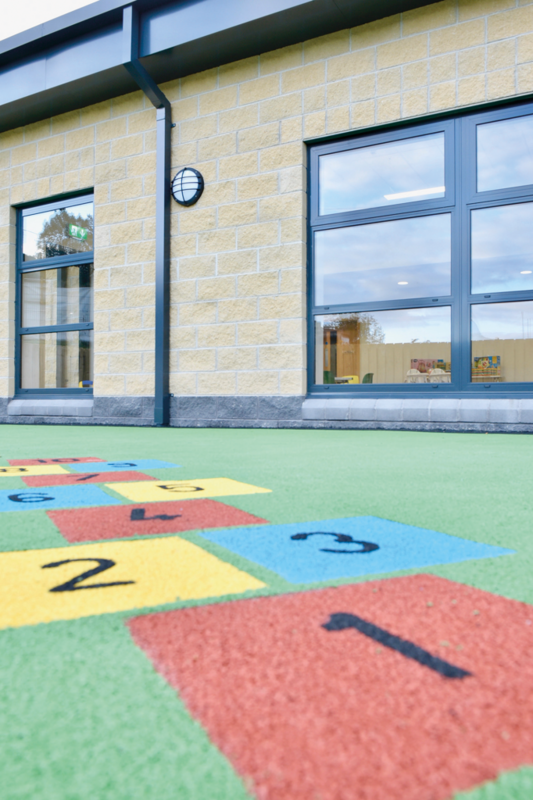 Completing jobs to a very high standard is the company’s motto and this was certainly the approach taken by the team for the Burren Community Centre. Nicholas O’Dwyer provided structural and civil engineering services at Burren Community Centre. 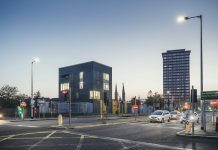 The company, which also acted as principal designer from a health and safety point of view, designed the steel frame, load bearing blockwork and the foundations for the job. What should have been a straightforward project was complicated by a requirement to ‘future-proof’ the building. Tony Holohan, Structural Engineer at Nicholas O’Dwyer, said, “Phase 2 of the project will consist of an additional building attached to this one. To allow for that, we had to work very closely with the steel fabricator to come up with detailed, intricate plans that would facilitate the future extension. The building and foundations had to accommodate current design conditions and future loadings so we designed connections to facilitate a future extension which will involve the extension/lengthening of the steel columns. With over 30 years’ experience in the construction industry, O’Hare Steel was the ideal choice when it came to supplying the structural steel frame for the Burren Community Centre project. The company uses the latest CAD technology to ensure that its fabrication drawings are accurately prepared in order to minimise on-site issues. Alongside prestigious projects like the Burren Community Centre, O’Hare Steel has worked on projects throughout Ireland and the UK, across a variety of industries. 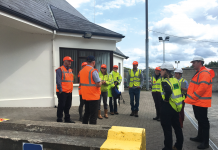 Each member of the O’Hare Steel team has years of hands-on experience and it was this knowledge that ensured the Burren project was completed on time and to such a high standard. Combined with their knowledge of the latest computer aided design software such as Tekla and Strucad, the team always strive to ensure that all projects are fully designed in line with the structural engineer’s details and delivered on time and within budget. The company’s just- in-time (JIT) way of operating helped ensure a speedy, efficient installation and a worthy addition to its already impressive portfolio. As Ireland’s largest asbestos removal company, the company produces site specific asbestos management plans with detailed procedures that ensure asbestos is managed in accordance with the Control of Asbestos Regulations 2012. When a risk is identified, the company assists in the continued management of the asbestos risk in line with the current regulations, or, as a licensed contractor, can carry out the removal of the asbestos under fully controlled conditions. This essential job was carried out by the Precision Group in an efficient, controlled and responsible manner. The company’s asbestos management team offers specific advice regarding asbestos issues and provides packages tailored to suit individual requirements in as cost- effective a manner as possible. 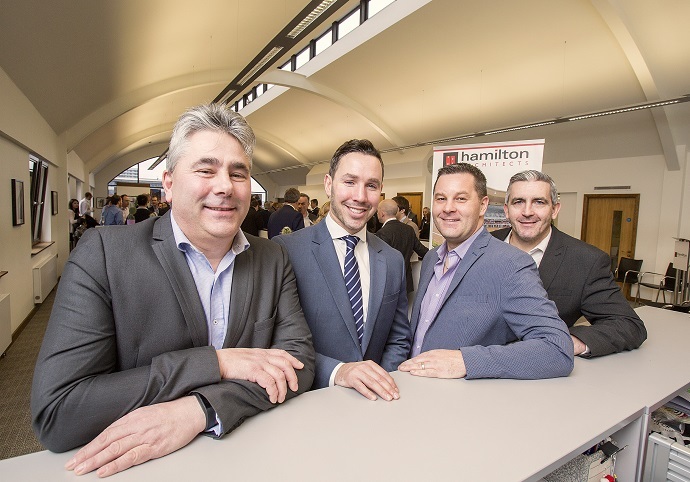 Precision Group has been providing professional, managed services and innovative solutions to customers across the UK, Ireland and Europe for over 30 years. It offers a diverse range of services including construction support services, facilities support services, environmental solutions and waste management, utility data capture and process equipment refurbishment. Ajob well done, the Burren Community Centre is another worthy addition to Guttertec’s already impressive portfolio. Gary McAleenan and the team at Guttertec were responsible for all the aluminium fascias, soffits and gutters on the project. An extremely tight timeline called for an extra level of efficiency. Gary has worked with Killowen Contracts on several past projects. Precast concrete floors for the Burren Community Centre project were manufactured, supplied and installed by Monaghan-based firm Spanwright. Part of Wright Quarry Products, Spanwright looks after projects that require precast concrete flooring, precast concrete stairs, precast concrete landing slabs, customised concrete wall panels and bespoke concrete solutions. The company has provided its services to a variety of small, medium and large projects, across a range of sectors in both Ireland and the UK. High levels of workmanship coupled with modern production facilities and techniques have made Spanwright the go-to company when it comes to precast floors and stairs. 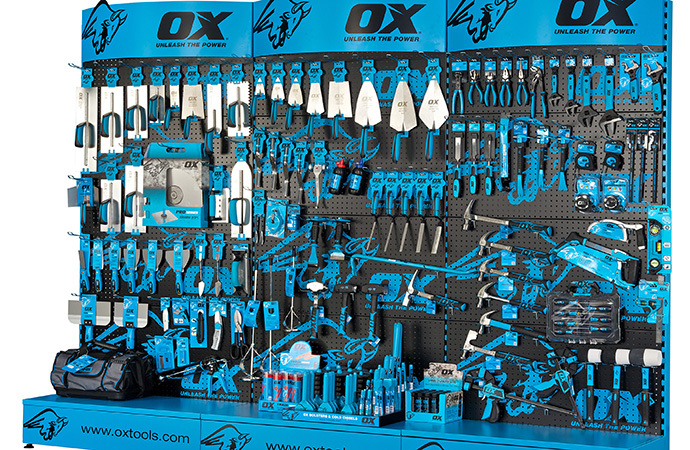 Whether a one-off item or repeat product, the company pays the same attention to detail at every step of the process, ensuring all customers are fully satisfied. For the Burren Community Centre project, an experienced fitting crew installed precast concrete floors efficiently and in a timely manner, with minimum disruption to other elements of work. 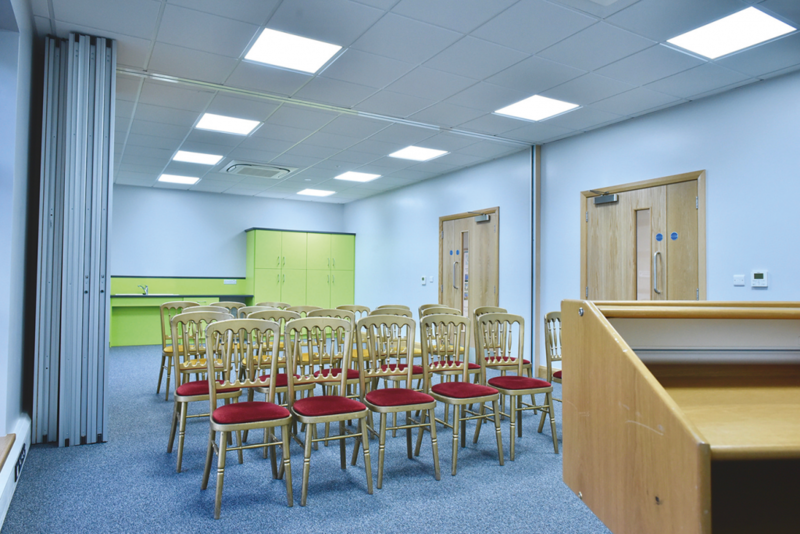 Only the highest quality furniture was specified for the Burren Community Centre. 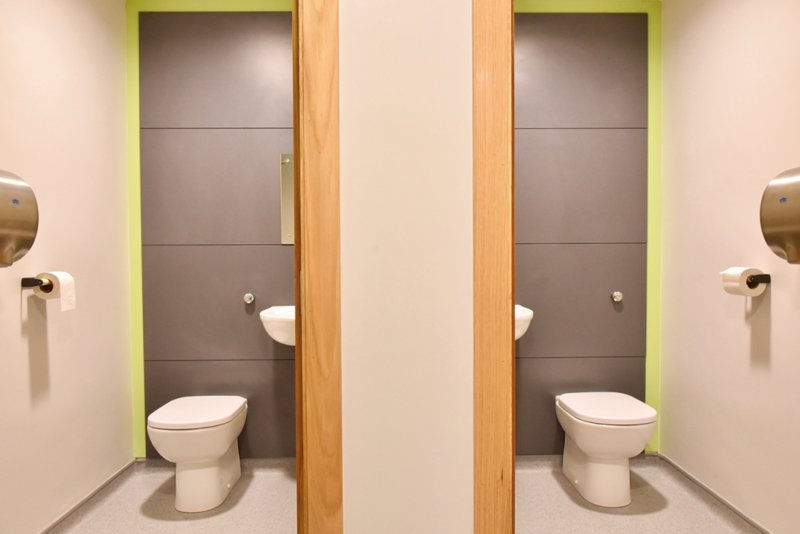 Thanks to its skilled and knowledgeable team, Hillside Interiors was the ideal company to design, manufacture and install a range of bespoke manufactured products to the Centre which included built-in furniture, toilet cubicles and a reception desk. Operating for over 25 years, the team at Hillside Interiors is renowned for its high standards of craftsmanship, attention to detail and timeless design. Only the finest timber is sourced and imported from Europe to produce superior cabinetry. The experienced team also has extensive experience in fitting granite and solid surfaces such as Corian and Hanex. The company can provide a complete project management service, to include structural modifications, plumbing, electrical and decorative work, if required. 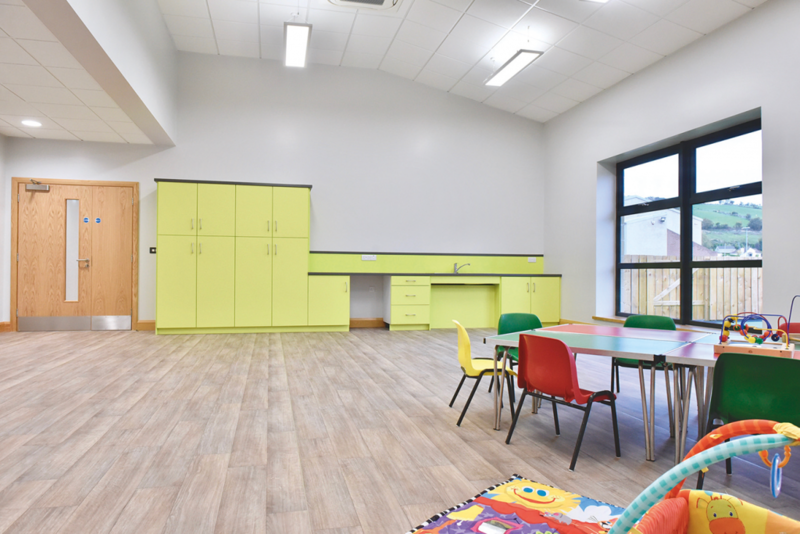 The beautiful, high spec furniture supplied to the Burren Community Centre is further proof of Hillside Interiors’ commitment to quality and has added the final touches to the impressive building. Bann Architectural Systems was tasked with manufacturing and fitting a range of top quality products for phase one of the Burren Community Centre project. Thanks to the company’s years of experience and commitment to providing clients with a superior finish, the products manufactured by the company have helped elevate the project. Aluminium windows, glazing and a curtain walling system were manufactured and fitted by the company. The team’s vast knowledge and experience of the market ensured a smooth installation. Bann Architectural Systems provides a range of products to the sector including window systems, doors, curtain walling, shopfronts, roof-glazing, patio and bi-fold doors. The company is an authorised fabricator of the Metal Technology and APS suite of profiles and is also a well-established local systems supplier to the UK and Irish markets. The commercial and domestic sectors are serviced by the firm, with both large and small contracts considered. As with all projects undertaken by the firm, the products supplied to the Burren Community Centre are of the highest quality and thanks to the team’s high levels of workmanship, will stand the test of time. Wall Cladding Services specialises in the supply and installation of hygienic cladding systems for walls and ceilings. 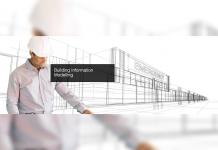 In order to ensure a quality service on every project, the company, which has been in operation for over 18 years, works closely with architects, designers, contractors and end users to provide a comprehensive service which includes free site surveys, technical advice, NBS Plus specifications, estimates and on-site project management. The company also offers back-to-back installation and product warranties with full professional insurances. With its comprehensive product range, the company can offer a system to meet every hygienic cladding specification. All systems offered by Wall Cladding Services are installed to the highest industry standards by the company’s highly experienced, CSR registered operatives. Led by Proprietor, Donald Marks, who can call upon over 30 years’ industry experience, the team at Wall Cladding Services sought to apply these same high standards at the Burren Community Centre. 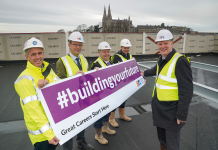 “We are delighted to have been chosen by Killowen Contracts to work with them on yet another of their prestigious projects and wish them every success for the future,” said Donald Marks.